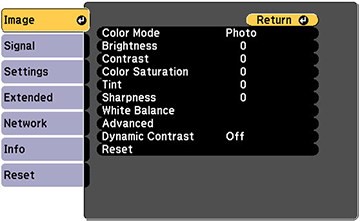 In the Dynamic color mode, you can turn on the Dynamic Contrast setting to automatically optimize the image luminance. This improves the image contrast based on the brightness of the content you project. Normal to adjust brightness at the standard speed. High Speed to adjust brightness as soon as the scene changes. Note: The Dynamic Contrast setting cannot be adjusted when Multi-Projection is set to On.